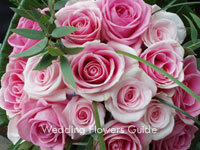 A challenge to every bride is choosing flowers to co-ordinate with the wedding color theme. 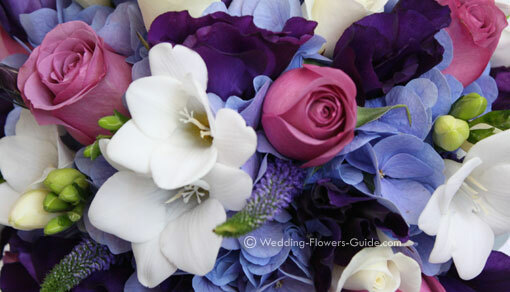 Here are some guidelines on how to choose the color of your wedding flowers. For bridal and bridesmaid's bouquets, an important point to consider is the color of the dresses. You can choose to co-ordinate or contrast the color of your flowers with the dresses. You can see in the photo above how I have added blue hydrangeas to the bridal bouquet to link with the blue of the bridesmaids dresses. If you are going to be wearing white, you can co-ordinate your flowers with your bridesmaids' dresses. You can see in the photo below how we did this at a recent wedding. The flowers used in the bride's bouquet are calla lilies, roses and wax flower. The foliage is hard ruscus. The bridesmaid's have white roses. The bridegroom's buttonhole (boutonniere) also featured a color co-ordinated mini calla lily. Choose your flowers after choosing your dresses and deciding on your wedding color theme. That way you can give a fabric swatch to your florist so he/she can color match the flowers. 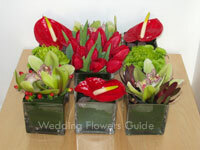 Some wedding colour themes are based around the colors of the season in which the wedding is being held. In the photo here you can see how I have created these wonderful bridal bouqets for a fall wedding theme. The bride, who was getting married in October, wanted to use the rich orange colors of the season teamed with deep purple to match the color of her bridesmaids' dresses. I really enjoyed working with this wonderful wedding color theme. If your wedding gown is going to be white or ivory, you will not have any problems with the color of your bouquet. But what if you are going for a colored dress? A little more thought needs to go into the color of your bouquet. Here are 3 ideas for you. a) Use the Same Color - A pleasing effect can be obtained by using flowers that are shades of the color of your wedding dress. For instance if your dress is blue you could incorporate flowers that include intense deep blue through to paler blues. This is sometimes called a monochromatic color scheme. This method of choosing shades of one color is also a common way to choose flowers for your wedding arrangements. The photo on the left is a bouquet that I made for a pink color theme wedding. Rather than just choose one type rose, I actually used 3 different varieties of rose in the bouquet. This provides a lovely variety of color. b) Use a Complementary Color - Using a complementary color provides a natural color harmony. If you have a red dress you could have a bouquet that was predominately green (the complementary color to red). The other complementary colors are yellow/purple and blue/orange. Complementary colors are colors that are opposite each other on the artist's color wheel. 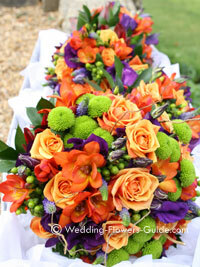 Complementary colors can also be used as a way for choosing the colors in your wedding flowers. In the photo on the left I created an arrangement based on the complementary colors of red and green. These included chrysanthemums, tulips, anthuriums, and orchids. c) Use White - If you are struggling to decide on colors for your bouquet, white wedding flowers will always look good against a colored dress. In the photo you can see how the white tulip bouquet looks wonderful against the red wedding dress and black cape. Sometimes brides tell me that they are nervous about having white flowers in-front of a white dress. One way to get arround this is to add foliage to the bouquet. A collar of dark green ruscus leaves will make the bouquet stand out beautifully.